You can bring the bird directly to CFRC- anytime. Call 910-687-6888during Center hours (Monday thru Friday 8am to 6pm, Saturday 8am to 2pm). After hours please opt for the after hour emergency line on our phone message and it transfer directly to our Director of Rehabilitation. We can try to arrange transport for someone to pick up the bird from you, or to meet you somewhere (if you are not local to the center). Please note that in a pick up situation you may have to hold the bird for up to 24 hours for us to arrange transport. We can not guarantee transport arrangements, but we will work hard at getting the bird to us, or another local rehabilitator for stabilization. PLEASE BE VERY CAREFUL WHEN HANDLING A WILD BIRD! THESE ARE STILL WILD ANIMALS AND CAN INJURE YOU! STRESSED OUT BIRDS CAN DIE VERY EASILY SO DON'T DRAW A CROWD. BIRDS NEED TO BE KEPT IN A DARK, QUIET, CLIMATE CONTROLLED AREA UNTIL WE CAN BE REACHED. Warning: Handling an injured raptor can be very dangerous. Only follow this procedure if you are unable to contact CFRC or your local District Wildlife Manager with NC Wildlife. Gently remove the covering before closing the box. If the bird is firmly attached to the blanket or sheet, try to expose the bird’s head. 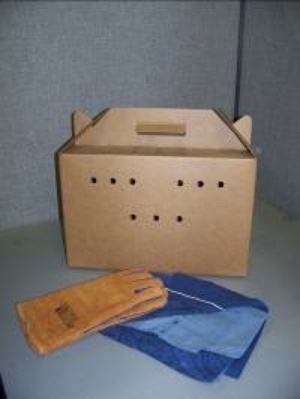 Place the box in a quiet room away from extreme temperatures and contact the CFRC or another licensed rehabilitator. All wild birds are protected by law. 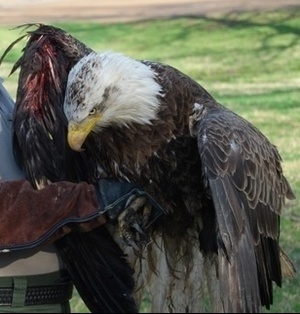 State and federal laws prohibit you from having any protected wildlife in your possession, even temporarily, unless you are transporting an injured raptor to receive medical attention. 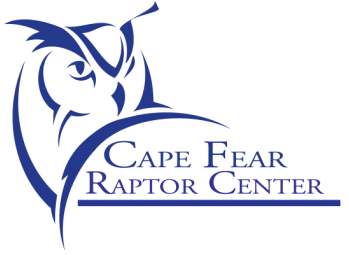 Call the raptor emergency line at 910-687-6888 to notify our rehabilitation staff. Do not transport a raptor in a person’s lap, unboxed or unrestrained. The bird could get loose and cause an accident or injury.